Why not call a skilled locksmith to handle all your emergencies? Getting locked out of your own home is incredibly frustrating, which is why, when you need a locksmith, you need someone who knows the ropes and responds quickly. Don’t panic when you’re locked out and don’t beat your frustration down on your door. Instead, give Handyman Near Me a call, and we’ll come to your rescue! We know that, when you need a locksmith, chances are you won’t be calling to book ahead. You need to get in now or else find somewhere else to spend the night. Call us when you’re looking for a locksmith near me, whether you need a new lock installed, a lock changed, or an emergency repair. 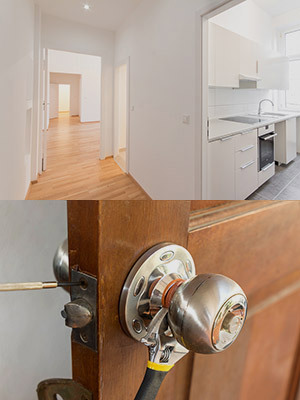 Adding a rental apartment to your home? Need more security on your property? Call us up, and we will install new, secure locks on your doors and wherever else you need in a flash. When you move to a new property, you don’t want to run the risk that the old owners still have a spare key lying around. Give yourself peace of mind and get your locks changed professionally so that you and your family are the only ones with a key. Broken lock? Stuck key? Whatever your lock issues are, our locksmith London pros are here to help! We will get out to you ASAP so that you can save your lock and get back inside in no time. When you find yourself locked out of your home or flat, contact us and we can grant you access to your property without any damages. Our services cover a wide range of home projects, making us the perfect call when you need a home-related fix. From professional locksmiths that can rescue you from a night locked out of your home to a full door replacement if your lock has broken so badly the integrity of the door was compromised. Just do us a big favour and don’t try to fix the lock on your own! A repair is far easier and faster to do than a replacement job, so next time you’re locked out of your home, give us a call first. We will advise you on what steps to take and send someone over from our team immediately. We service all of the London boroughs and are available 24/7. We also offer same-day appointments, so if you discover the lock issue before you leave for work, you can schedule us to fix it when you get back home. Give your entire home a facelift, or just add in new locks. Whatever your locksmith issue, let us be a part of it. Give us a call today to learn more about our full range of services and of course to get a free quote on the spot.